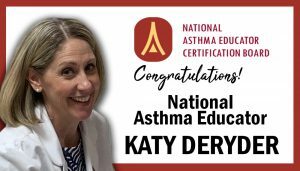 Congratulations to Katy DeRyder, a school health advisor at Southwestern Elementary School, who recently certified as a National Asthma Educator by the Consortium for Infant and Child Health at Eastern Virginia Medical School (EVMS). Katy joins Michelle Prescott, who works at the Edwards Wilson Center as a Preschool Intake Nurse, as the division’s second certified National Asthma Educator. Both Katy and Michelle are knowledgeable and passionate advocates for students, staff members, and families living with asthma. Read more about the National Asthma Educator Certification Board on their website.